Dorothy Velasco reviews the Oregon Shakespeare Festival's production of The Merry Wives of Windsor. 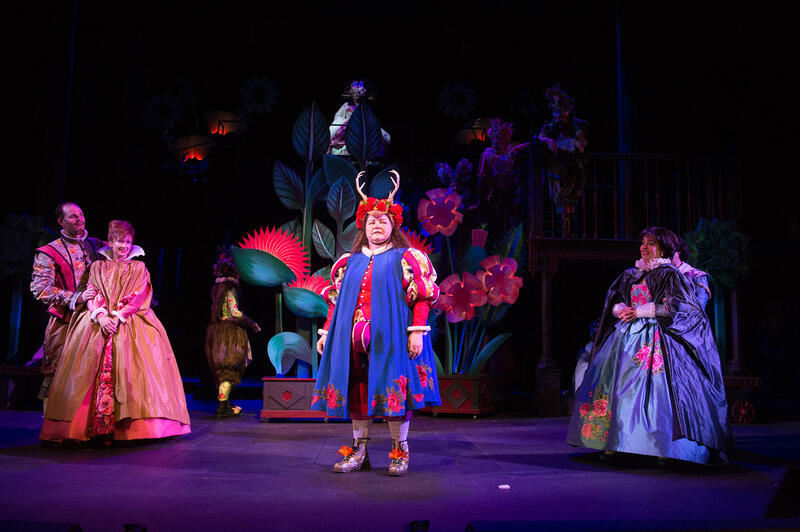 The last time the Oregon Shakespeare Festival produced “The Merry Wives of Windsor,” the company set Shakespeare’s ditzy comedy in Iowa during an election. In the current version we meet middle class residents of an Elizabethan small town that seems touched with a whimsical hint of the 1980s. Falstaff, Queen Elizabeth’s favorite character, has lost Prince Hal’s friendship now that Hal is king. He seeks amusement by trying to seduce Mistress Page and Mistress Ford, two upstanding matrons. The twist in this production is that Falstaff is played by a woman, the delightfully comic K.T. Vogt, sporting a big belly, a scrappy beard, and an extra-large codpiece that also serves as a money bag. Mistress Page, when not tormenting Falstaff, focusses on the marriage prospects of her lively daughter Anne. The mother favors Dr. Caius, a French physician. Father prefers the foppish Master Slender, but Anne has a mind of her own and opposes a typical arranged marriage. Her choice is an awkward but endearing gentleman, and she uses her wiles to win the day. That’s about as deep as it gets, although the snippets of familiar music add surprising jolts of humor. The play flaunts as many phallic sight gags as the Greek comedy “Lysistrata.” It’s funny at first, but grows repetitious during three hours of over-the-top silliness. Although director Dawn Monique Williams sets a frenetic pace, the show is overstuffed with jokes that lack a satisfying payoff. Here’s my tip for actor watching: Keep your eyes on Catherine Castellanos as Mistress Quickly. Last year she played major roles in “Richard II” and “Roe.” This season, besides “Merry Wives,” she’s in “The Odyssey.” Castellanos is always natural and remarkably comprehensible.